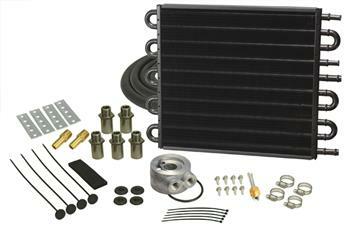 Derale Universal Oil Cooler - Dual Circuit UNIVERSAL - Dezod Motorsports Inc - Home of the automotive performance enthusiast since 2002. Featuring a free-flowing 4 & 4, 4 & 6 or 8 & 8 pass cooler in one compact package and fabricated of 1/2” copper tubing and aluminum cooling fins, this Made-in-the-USA Dual-circuit cooler includes 2 each 11/32” and 2 each 1/2” barb inlets. It provides heat transfer capabilities for engine and transmission and kit also comes with a thermostatic sandwich adapter, cooler mounting rods, insta-dapt radiator adapter, hose clamps and 5 engine filter thread sizes to accommodate most vehicles. Made in the USA.